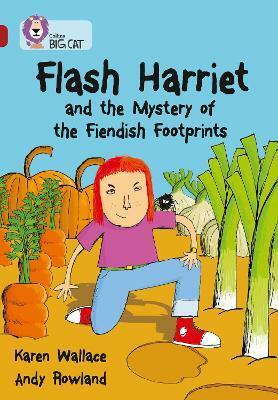 Flash Harriet, together with Gus, her pet tarantula, is back and on the trail of a new crime. Huge footprints have smashed up the local vegetable garden. Is it something to do with Marmaduke Mildew and the Giant Vegetable Competition? Or does the clue lie in the footprints themselves? Find out how our favouite detective solves the mystery. * Ruby/Band 14 books give increasing opportunities for children to develop their skills of inference and deduction. * Text type: A humorous story. * The step-by-step review of the clues that helped Flash Harriet solve the case on pages 46-47 enable children to recap the significant events of the story. * Curriculum links: Science: Helping plants grow well; Citizenship: People who help us - the local police.